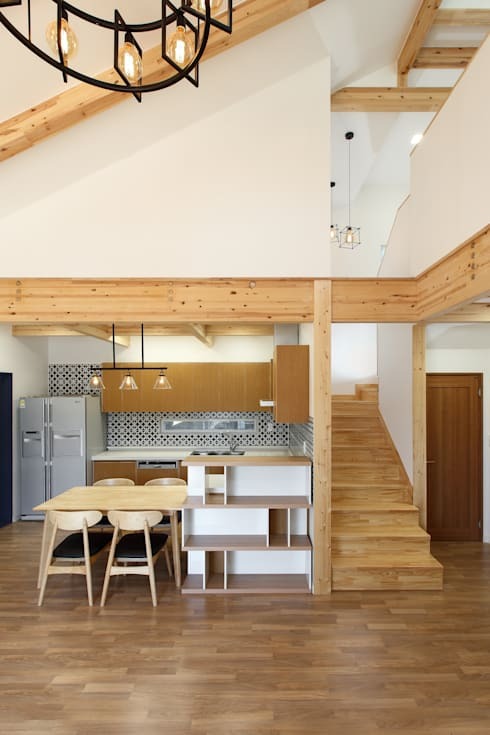 This adorable cottage is from South Korea, where it meets the needs of a two-child nuclear family in only 376 square feet of space. 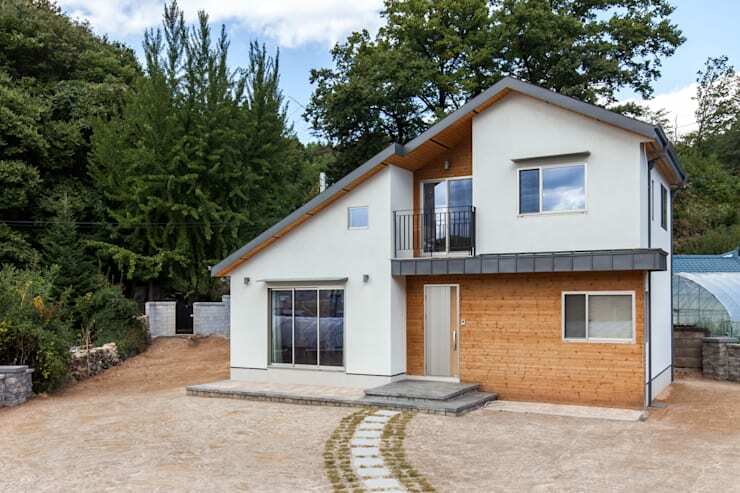 This is a modular, prefabricated home that saves on expense and uses ecologically friendly materials. There's plenty of wood used in this home to capture that quintessential cottage and West Coast feeling, but this is combined with some modern elements that make the home comfortable for long trips, or permanent residence. Of course, elements of contemporary Korean style have found their way into the home too. This cottage is surrounded by the tranquility of nature and will offer you inspiration for your own rural get-away. This simply darling exterior has a lot of cottage elements turned modern. The simple peaked roof of a rural home has been made just a touch modern with its small indent on the left side of the house. A classic wooden exterior has been combined with the backbone of modern design: sweet and simple white. There's a balcony to take in the view of the surroundings woods, but it is wrought iron and supported by a stripe of dark flooring that visually separates the rustic wood from the clean white. 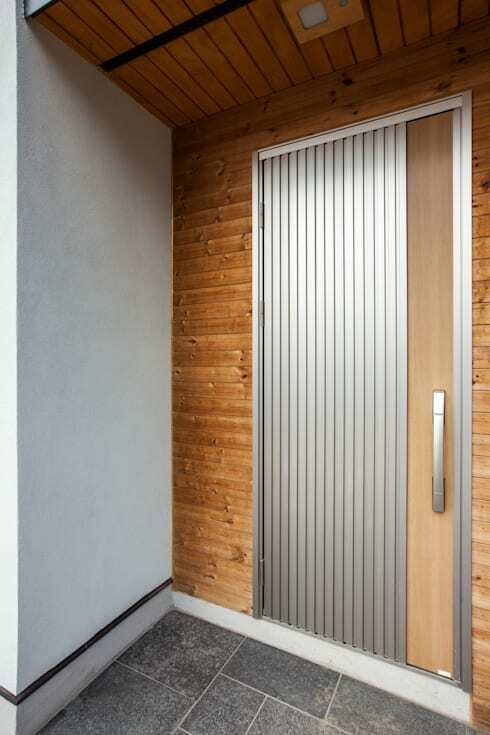 If you want a well-made door to protect you from the elements, you can't go wrong with this beauty. Its combination of wood and metal looks sturdy and fits with the stylistic elements of the home. This door adds a feeling of security to this rural home that we're sure the residents appreciate. This cute cottage kitchen is just the kind of space you want to pop into for a quick weekend breakfast. It has all of your necessities laid out in a simple floor plan that just makes sense. The shelf next to the dining table is clearly Korean-inspired and looks chic, echoing the house's combination of white and wood. If you want a rustic kitchen and are looking for some more inspiration, we have you covered with our discussion of some of the best rustic kitchens we've seen. Who wouldn't love this huge ceiling? That unique lighting fixture draws our attention up to these enormous ceilings. They have to remind you that you're in a cottage with those wooden ceiling beams. The beams also add a rustic flair to this otherwise modern living space. Then there's that double-door exit to the outdoors, convenient for summer fun but also great for flooding the home with natural light. All this room needs now is some furniture and some personal touches, perhaps from an interior designer. There are wood touches everywhere in this house, but the trim gets a little more complex here as it joins up with the wooden beams. Overall, the use of wooden trim everywhere provides a sense of unity to the home. The doors in a deeper mahogany add some depth to the home, as the darker colour draws the eye back. 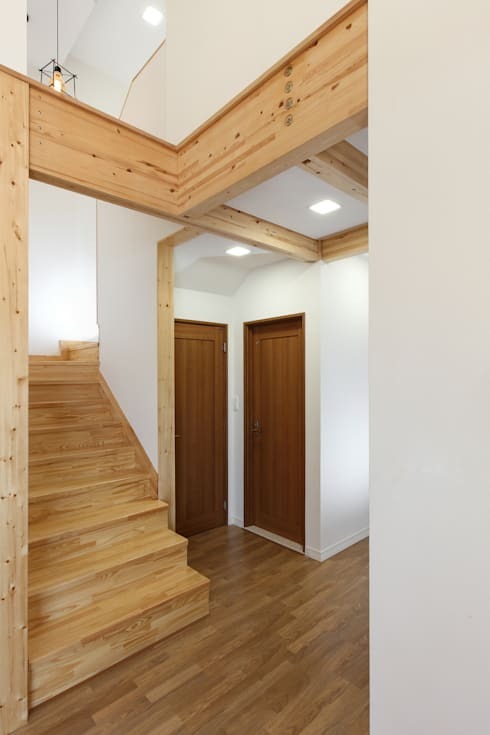 If every wood had the same finish the house might feel drab, but the three finishes on the floor, stairs, and doors respectively keep things fresh and comfortable at the same time. This room is full of blue tones that feel rejuvenating in this morning light. It's an ideal kid's bedroom for the cottage. 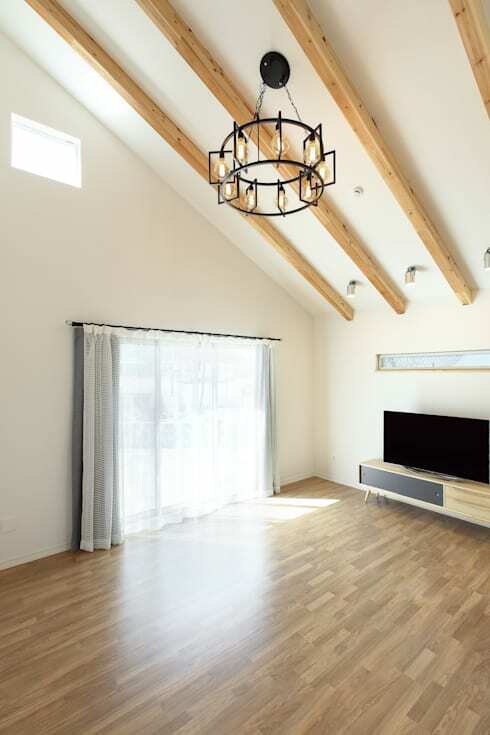 It has the necessities laid out simply, but with the stylistic elements of the rest of the home, like the wooden finishes and ceiling beams, modern window finishing, and some Korean-inspired furniture. 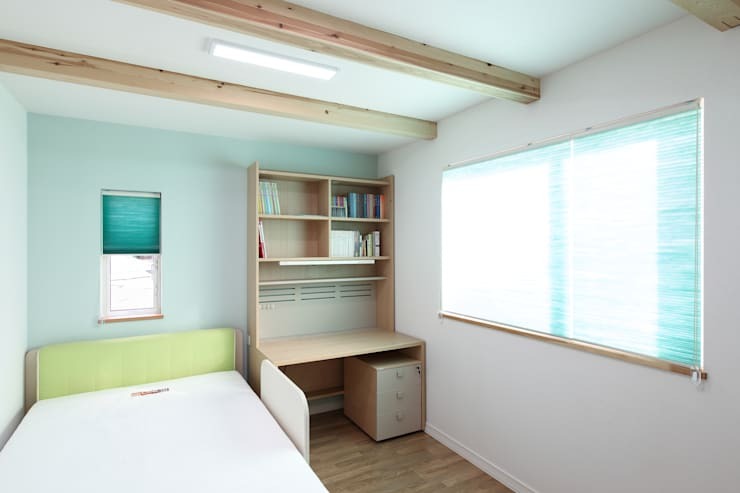 That bed's bright green headboard is sure to be someone's favourite part of the room. Looking to update, or add, an unusual bed to your home? We have some wild designs, and some more familiar options, here. Have you considered using wood as a building or design material? Let us know in the comments!